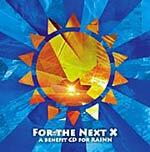 In celebration of RAINN's 10th Anniversary year, a new compilation CD was released on July 27, 2004 called For The Next X: A Benefit CD For RAINN. Tori has a song on this CD, which is the remastered version of Silent All These Years which previously was only on her Tales Of A Librarian album. Other artists on the CD include Michelle Branch, Indigo Girls, Dar Williams, Ben Jelen, Matchbox Twenty and more. While Tori's song is available elsewhere, most of the other songs are either live, unreleased, or have seen limited release. All of the artists on the CD have agreed to donate the use of their songs, therefore 100% of the proceeds will benefit RAINN. You can check out the full track listing and find details on ordering this album at rainn.org. The album cover can also be seen to the right. The CD now sells for $12.99. 1. Tori Amos "Silent All These Years"
2. Matchbox Twenty "All I Need"
5. Last Night in Cell 6 "Sing My Praises"
6. Indigo Girls "All That We Let In"
7. The Ben Taylor Band "Day After Day"
9. Lourds "I'm Not Afraid Anymore"
10. Dar Williams "As Cool As I Am"
11. Michelle Branch "You Get Me"
12. Ryan Sudick "Pablo's Halo"